Selling more and more phones has become increasingly difficult for Apple. Amid slowing iPhone sales, the company has shifted focus to services to drive growth. But the iPhone remains the biggest contributor to its revenues, and the company has to bring compelling features with the upcoming iPhone 11 to convince people to upgrade. We don’t know what the device would look like, but we have already seen some cool iPhone 11 concept renders imagining it. Now a designer has come up with an iPhone 11 concept video showing off what it might look like without the notch. 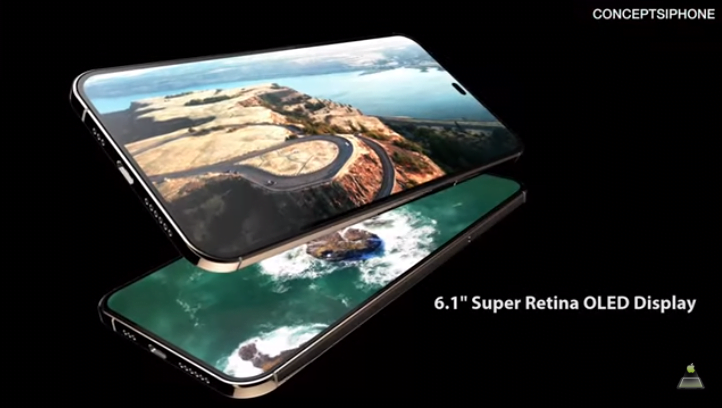 While the notch on the iPhone X and XS series received some criticism, consumers seem to be loving the hole-punch display of Samsung’s latest Galaxy S10 series. Instead of adopting the notch, the Korean company has used an Infinity-O display on its flagship phones, which has a hole in the top-right corner of the screen to accommodate the front-facing cameras. The iPhone 11 concept video was created by Hasan Kaymak for YouTube channel ConceptsiPhone. The designer has ditched the notch in favor of a Galaxy S10-like hole-punch display. But the hole appears in the top-center of iPhone 11 instead of the top-right corner. While Samsung has put only the front camera in the hole-punch cutout, the concept iPhone accommodates both the front camera and the TrueDepth camera system that enables Face ID technology. Hasan Kaymak believes Apple will reduce the size of Face ID sensors to pack them in a small hole in the screen. The designer imagines the iPhone 11 with an upgraded Face ID 2 as well as the in-display fingerprint sensor, which allows you to unlock the device by putting your finger on the screen. The iPhone 11 concept video shows off a gorgeous 6.1-inch Super Retina OLED display with 1440 x 3040 resolution. The screen is protected by Corning’s Gorilla Glass 6. It has a vertically-aligned triple camera system on the back. It’s worth pointing out that this is not a leak. It’s just the imagination of a designer. The actual device might look entirely different. The concept phone charges via a USB Type-C port and comes with an insanely fast 100W charger. In reality, Apple ships the current flagship iPhones with a miserable 5W charger. The concept iPhone 11 also features Wireless PowerShare technology that allows you to charge your Apple Watch, AirPods cases, and other accessories by putting them on the back of your iPhone. In the last few weeks, we have seen a handful of leaked iPhone 11 schematics, including from reliable tipster Steve H.McFly. The schematics show a design similar to that of the existing iPhone XS series. However, the rear camera is set to get a major upgrade, at least on the larger iPhone 11 Max. While the iPhone 11 Max would feature three lenses on the back, the other two phones would offer dual cameras. According to schematics shared by Steve H.McFly, the iPhone 11 Max would have a squared camera bump on the back. It would consist of three lenses in a triangular fashion, an LED flash, and a microphone. It doesn’t look attractive at all, but Apple might adopt this design based on the arrangement of internal components. Past reports have indicated that the device would feature two 14MP lenses and a 10MP sensor on the back. One of the three lenses is said to be a 3D Time-of-Flight sensor that measures the time it takes for the light to bounce off an object to create an accurate 3D image of the scene. The Time-of-Flight sensor would enhance the augmented reality and portrait photography experiences. The iPhone 11 series is expected to run the A13 processor and iOS 13 software. Recent reports suggest the iOS 13 would bring a system-wide Dark Mode and many iPad-specific enhancements such as a new Home screen, a revamped Files app, and the ability to tab through different pages of an app like pages in a web browser. Last week, supply chain sources told Japanese blog Mac Otakara that the iPhone 11 would offer bidirectional wireless charging similar to Samsung’s Galaxy S10. It would also ship with an 18W fast charger and a USB-C to Lightning cable. Noted Apple analyst Ming-Chi Kuo of TF International Securities predicts the iPhone XS successor would get a 20-25% bigger battery while the iPhone XS Max successor’s battery would be 10-15% larger to accommodate the Wireless PowerShare feature.